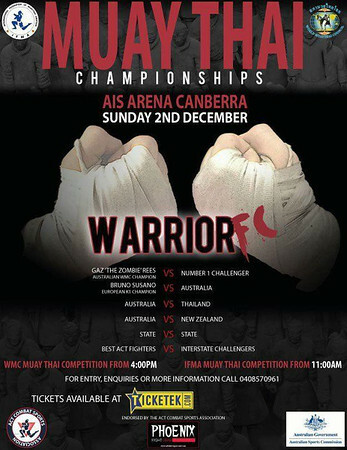 Warrior FC will be held in the AIS Arena at the Australian Institute of Sport (AIS) in Canberra, ACT. 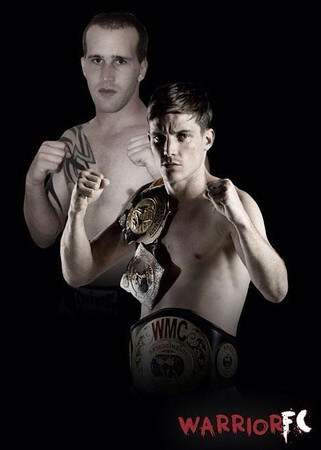 Warrior FC (Fighting Championships) is two shows, featuring both Muay Thai and MMA, in one day. From 11:00am Warrior FC will feature amateurs; padded fights for first timers and for people with 3 fights or less to gain experience. From 4:00pm the professional fighters’ part of the card will be shown. Apparently, the organizers are seeking out fighters to be part of this card and they are poening fighter registrations. If you wish to be a part of the event and have a fighter you would like on either the mid morning or afternoon show, please contact Anthony Manning from Phoenix Gym on 0408 570 961 or myself, Kieran Walsh, on 0413 836 490. Mark Sarracino vs. Dane ‘Daddy Kool’ Beaucham, 5 X 3, Full Muay Thai rules. Gaz ‘the Zombie’ Rees (Australia) vs. Jamie Eavds (New Zealand), 5 X 3 Full Muay Thai rules.